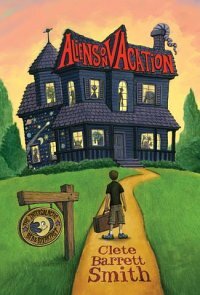 Aliens on Vacation by Clete Smith with illustrations by Christian Slade. Release date: May 3, 2011, pre-order now! I got my advance copy via NetGalley. Scrub is a twelve-year-old from Florida who has been exiled to Washington State for the summer to live with his grandmother at her bed-and-breakfast in a small town. He's missing basketball and his best friend, and it doesn't help that his grandmother is both a hippie and an outer space fan. He thinks he's about to deal with a lot of Trekkies, but the Tourists he meets in Forest Grove are considerably stranger than even he could have expected. The book is told in the first-person from David "Scrub" Elliott's point-of-view, and it manages to develop him as a character very well, much of it from his reactions to the people he meets. The rest of the cast is seen through his eyes and so are colored by his reactions to them, an appropriate style for this type of book. The reading level is pre-teen or younger and the artwork by Christian Slade on each chapter heading makes for an attractive read, as well. There are a lot of references that adults will appreciate far more than children, making this a good read for any age. As a Seattle native with a great love of my state, I was tickled by the jokes about Washington and the references to other places, including Canada. I was able to figure out approximately where the fictional town of Forest Grove must be located, and enjoyed when a former hometown of mine got a namecheck. This is a good book for children of all ages to enjoy, suitable for family reading time or a solo read. Fans of science fiction will probably enjoy it a lot, but people who generally don't read fantastic fiction will likely find it palatable as well. It is the first book in a proposed series, but manages to stand alone very nicely. I'm looking forward to seeking out any sequels, personally. Worth a read.